Jose Daniel Ortega Saavedra is the current and 83rd president of Nicaragua; the poorest country in Central America. Ortega ran as the candidate for the Sandinista National Liberation Front party and was elected on November of 2006 with 37.99% of the votes. Ortega also previously served as president of the country back from January 10, 1985 until April 25, 1990 as the 79th president. Like the United States Constitution the Nicaraguan Constitution only permits a president to serve two terms. The Nicaraguan Constitution also bans a president from serving consecutive terms. To amend the constitution a majority vote would be required from congress. However, with President Ortega having control over parties in the courts, the electoral tribunal, and the police he was able to surpass these obstacles. 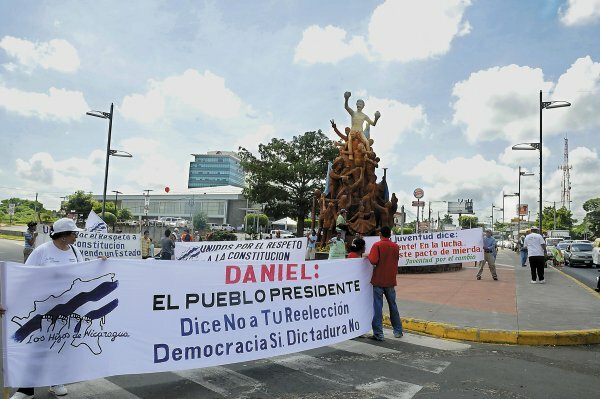 On October 19, 2009 six judges of the Supreme Court of the Sandinista party secretly met and unanimously banned the constitution requirements and petitioned that they did not apply to President Daniel Ortega according to In Nicaragua, Opposition Sees an End Run according to the New Your Times. The controversy also spans from the fact that the ruling was brought together when no opposition judges were available or able to preside and possibly argue the ruling. The actions are considered illegal and unconstitutional by many. Many Nicaraguans including former Sandinista followers and various opposing party’s attempting to oust Ortega, it is unpredictable what the elections will be like when they take place on November 6, 2011. President Ortega has a history of controversy and opposition. Seventeen years prior to running for his first term Ortega was imprisoned for robbing one of the largest banks in Nicaragua. He was later exiled to Cuba where Ortega was provided with guerilla training. He secretly returned to Nicaragua shortly after. Although his first run for elections were said to be fair according to several government delegations and associations; the Latin American Studies Associations claimed the party did “take advantage more….than parties everywhere routinely do”. Controversy was held at the end of Ortega’s service when a legislative actsknown as “The Piñata” was passed. “The Piñata” permitted the Sandinista party to illegally seize billions in private property for the use of Sandinista officials including Ortega. The fore mentioned actions made it difficult for Ortega to successfully win presidency through his next several attempts for reelections. His second run for election was also a controversial from the beginning. Unlike the first election many agree the election was not held fairly and changes were made to electoral law prior to the election to ensure Ortega’s success. In previous elections a runoff of 45% of the votes was required. If the 45% was not met a second election would be held with the two most successful parties according to percentages. However the electoral law was changed to 35% ensuring Ortega’s presidential run with 37.99% of the votes according to Sandinista Fervor Turns Sour for Former Comrades of Nicaragua\'s President written by Marc Lacey. Ortega and the Sandinistas strategies have ensured Ortega’s power and the possibility the president will serve a third five year term for the country. Ortega having close ties with Venezuela president Hugo Chavez adds to the controversy. Chavez has provided Ortega with billions helping to ensure the presidents reelection through both investments and power. The funds help Ortega by expanding his power over a network of companies and ultimately political power. With Ortega’s numerous ties opposing parties are finding difficulty in coordinating any opposition against the President. Some even fear speaking against the President due to Ortega supporters taking delinquent and violent actions to anyone who publicly criticizes the President. One example is American ambassador Robert Callahan who was attacked after giving a public speech that disapproved of Ortega’s methods. Many, including Nicaraguan Vice President Jaime Morales Carazo, fear Ortega’s reelection will inevitably lead to a dictatorship. The Vice President has informed the public of his wishes to step down from office if Ortega is reelected. However, this may also cause more controversy setting a slot for one more Ortega supporter to move in. With little support from other countries except for Venezuela and Cuba the fight is left to the Nicaraguan people. As Fabio Gadea a former presidential candidate stated “The ones who must defend democracy are us, the Nicaraguans”, however the country may be at a loss as Supreme Court Magistrate Sergio Cuarezma desperately stated “The Sandinistas control everything. What can I do?”. To get updated information on the November 2011 elections please visit La Prensa online media newspaper.